Earthen structures are the world's oldest and most ubiquitous shelters. They come in an astonishing panoply of type and style from the troglodytic, which is to say cave dwellings, of both early Europeans and current communities in North Africa, to the towering rammed earth apartment buildings of Yemen and the immense, communal round adobe Hakka houses in China. Earthen shelters have been constructed on every continent including Antarctica where stone and borrowed ice were assembled into tiny refuges by early explorers. I might even argue that they have been built in the Arctic -- where there is no underlying continent -- if I Clintonize the definition of earth to mean terrain. In that case igloos, made from blocks of ice and snow cut from the topography might qualify. But there is no need to stretch the point since fully half the planet's population lives in indisputable examples of earthen architecture anyway. For many, the most remarkable of these examples are those that occur in tropical climates. Really, it should not be surprising to find successful, millennia-old traditions in regions that get a hundred-plus inches of rain in a year. This is because many of those regions, from Mesoamerica to Nigeria and beyond, have thick and widespread deposits of rich clays, such as laterite, that lend themselves magnificently to construction. A ready supply of material is an advantage that compliments simplicity of technology. Earth can be mixed with straw and patted onto a network of sticks or bamboo called wattle and daub or quincha; it might be cast into adobe blocks; or it can be patted into courses. All of these styles can be found in the tropics, and all are successful. The secrets (which are not secrets at all) are siting the structures so that water drains away, and giving them an eave so that water drains off. When maintenance is required, it is typically accomplished in a matter of minutes by whichever family member notices the need. Maintenance, in fact, tends to become ritual. 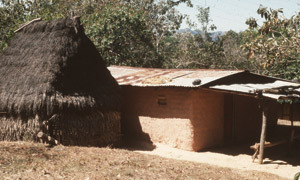 In the Chiriqui District of western Panama the Guaymi people build their homes of quincha. I had many opportunities to examine these structures during the 1990s when I helped coordinate small-scale potable water projects for the Santa Fe based organization, Waterlines. On one trip I recruited two young men from Zuni Pueblo to accompany me. Both were trainees in a second program that I was helping with, and that was the re-opening of the historic stone quarries on the reservation, an effort spearheaded by another Santa Fe organization, Cornerstones Community Partnerships. The Zuni, as you might assume, also have considerable ritual surrounding the building of their earthen architecture. We were guests in a mountain community called alternately Flor de Café and La Nube de Alto Caballero. Every morning, we noted, one member of each family would take a bundle of palm fronds and sweep debris away from the base of the walls on the outside. Besides leaving the place neat and tidy, the ritual cleared away insects and moisture-retaining detritus and facilitated a habitual inspection of the structure. If a bit of repair was called for a wad of mud was mixed and applied then and there. Evenings in La Nube were times of social exchange, particularly between the Guaymi and the Zuni. They were fascinated with each other, both groups being Native American, and the conversations went deep into the night. Part of the reason they lasted so long was that the Zuni didn't speak Guaymi or Spanish, and the Guaymi didn't speak Zuni or English. I was called upon for the trying but rewarding job of translating. One evening, the Zuni guys pulled out their snapshots of home. These were passed very slowly and deliberately through a group of about twenty. By candlelight there was much close examination and pointing and whispering in Guaymi, of which I didn't understand a word. Finally, a young woman had to ask: Were these pictures really taken in the United States? It occurred to me what an iconoclastic moment it was. Most everyone who has never been to the U.S. carries a mental image of paved streets, green lawns and tidy white bungalows. What the Guaymi were incredulously viewing was a community of dusty roads, no trace of vegetation and what seemed a tumbledown, random array of stone and adobe houses. This conversation, I could tell, was going to be a long one. Thankfully, I was proved wrong. There were a few questions about the stone and adobe: Were the materials from Zuni or brought in from somewhere else? Does everyone build their own house or is that a special skill? Do you have special houses for prayer? Soon the same young woman who had expressed the initial doubts (which by now were being dispelled) about where the photos were taken asked a key question: How long have you lived there? With only a moment's hesitation one of the Zunis responded, We emerged from there. For a translator, there is nothing difficult about the words. But I was struck dumb with the challenge of portraying what had just been implied. First, that the Zuni don't conceive time in a linear fashion and so "how long" is an entirely subjective idea to which numbers cannot be attached. 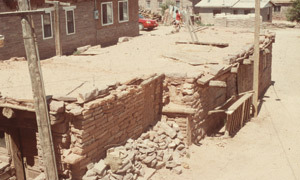 Second, that the assumption of age by the Guaymi based on the appearance of the houses was completely lost on the Zuni who are constantly about tearing down and rebuilding. And, third, that there was an origin story being alluded to that had to do with migration and the passing from a lower third world into the upper fourth, and present, world. How would I stumble through this? Finally I realized that I was filtering the question and the answer through a Western screen. In one of my rare moments of lucid thought I just translated the words and, of course, the Guaymi understood instantly and completely. Being non-Westerners themselves, they got all the implications and everyone retired early and content at having discovered, in the most unlikely of places, some profound commonalities. Such is the magic of earth that a highly educated white man can be brought to his academic knees by the turn of a phrase. Both the Zuni and the Guaymi have responded very, very successfully to their utterly different environments with the use of earth and stone over exceedingly long periods of time. My emergence into the world of earthen buildings can be measured in a few pitiful decades. I have a lot to learn from those whose emergence can only be viewed from time immemorial.